Martin is currently finishing his degree in Linguistics and Languages at UPEA. He became interested in this area when he was studying theology at a Bible Institute. His favorite subjects are Pragmatics and Syntax. Involved in several writing projects for Santidad Friends, where he is a member, Martin edits “The Quaker” bulletin, is helping to write a Yearly Meeting history, and is developing brochures for the Seventh Day. 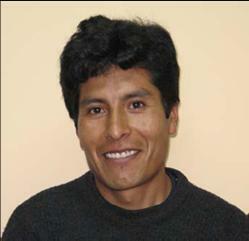 Martin also wants to create communication materials for the Aymara language and for his church. Born in Quillihuyo, Martin lives in El Alto. He lost both of his parents at a very young age, his 2 brothers both have families and office jobs. In his spare time, Martin enjoys playing volleyball and soccer. Martin has had a BQEF scholarship since 2008.